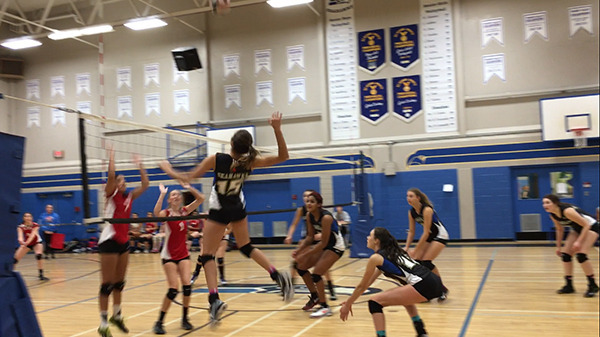 Volleyball teams from across B.C. came together this past weekend in a tournament honouring the memory of a North Delta athlete. Seaquam Seahawks pose with their trophy after winning the Pink Ribbon for Camille Senior Grils Volleyball Tournament on Oct. 15. Sixteen teams competed in the 2016 Pink Ribbon for Camille Senior Girls Volleyball Tournament, held Oct. 14-15 at Seaquam and North Delta secondary schools. The tournament commemorates the life of Camille Gregory, a Seaquam graduate and volleyball ace who passed away from from cancer in 2012 at the age of 23. “Camille was a triple threat…smart, social, and athletic. She was brilliant, but more importantly, she was a kind, caring person,” said Todd Clarke, her former coach at Seaquam and tournament organizer. This year, the Seaquam Seahawks took first place over the Lord Byng Grey Ghosts from Vancouver. Surrey’s Lord Tweedsmuir Panthers and Vancouver’s Little Flower Academy Angels tied for third. Spectators were asked to make a $2 contribution to be donated to the B.C. Cancer Society in Gregory’s name. 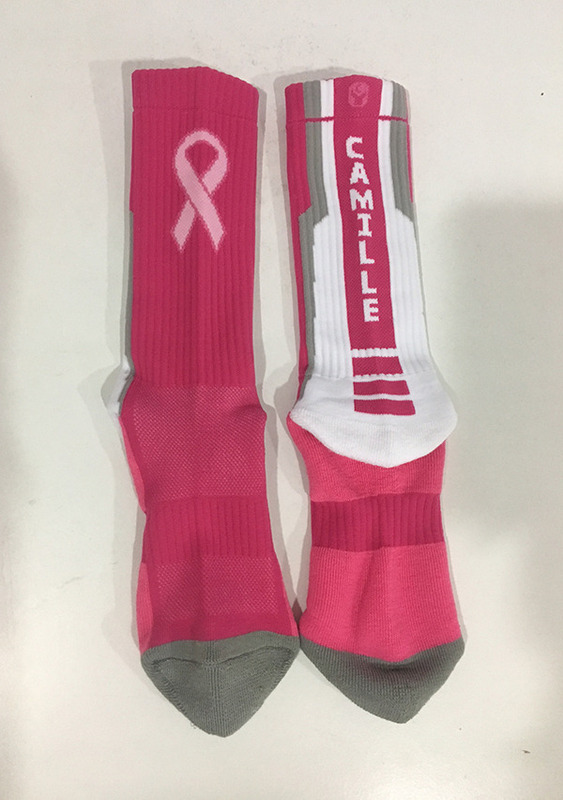 As well, each player in the tournament received a pair of Pink Ribbon for Camille socks (pictured) to mark the occasion. 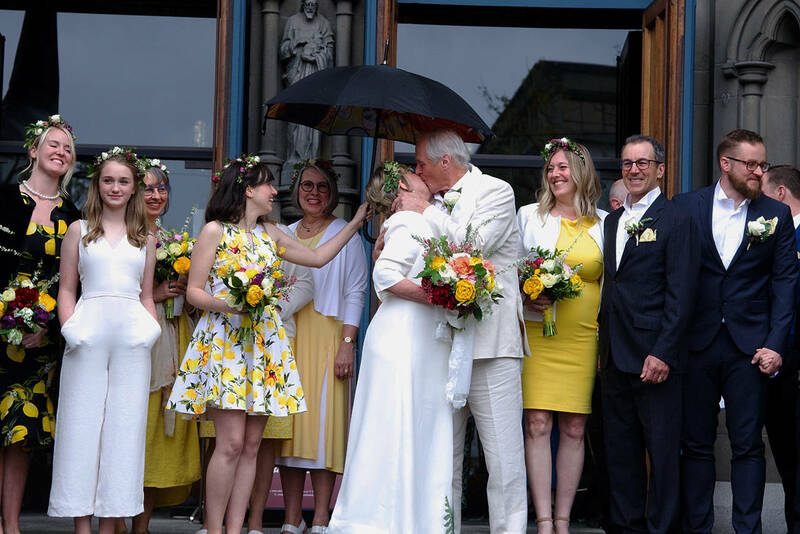 After learning of her diagnosis in 2009, Gregory was able to maintain straight A’s at UBC, complete a co-op position with Bayer Pharma, cycle through Europe and make her way to London to cheer on Team Canada during the 2012 Summer Olympic Games. She went on to earn a degree in Honours Chemistry from UBC just days before she passed away. Thanks again for honouring Camille with this tournament. Volleyball was a big part of her teen years and it had a special place in her heart. As you may recall, Camille was a very focused young woman who set her sights high and worked very hard to achieve her goals. Camille went to Sunshine Hills Elementary and then to Seaquam Secondary, graduating in 2007. She was a hard working, straight-A student all through high school and university. Camille loved playing volleyball from Grade 8-12 at school and also played club with Big Kahuna, Team X and Synergy, winning provincials in Grade 11. At 5’10” she played middle and was pleased to go to Hawaii, Washington State, Nevada, Alberta and all over B.C. with her teams. She loved to travel and even worked as a fashion model in Japan for three summers. She was always interested in learning new things and making new friends. At University she was recruited by many departments finally settling on Science where she studied Honours Chemistry. She was 20 when she found a strange mole on her arm which was cancerous. She had several surgeries and treatments but never let any pain or suffering get in her way. She received her chemistry degree from UBC in a special ceremony four days before she passed away from malignant melanoma on Sept. 17, 2012 at 23. She was a compassionate, caring and loving girl. She was always interested in cooking and baking, often sharing her concoctions with friends and family. She loved to be surprised and laughed often. We know she would be very pleased to have this volleyball tournament in her honour, but would also want to make sure that everyone fighting cancer was equally acknowledged and support any and all efforts to eradicate it completely. She was a fierce competitor who never gave up, in volleyball or in life. We hope that everyone has a great weekend and finds time to be inspired by Camille’s spirit, as a person who never let anything stand in her way to being her best.